Movie Review: ‘THE FIRST PURGE’ – what is this kibble? It’s simple. There’s nothing left to say about THE PURGE movies. Where once was a deranged world looking to be explored in the same fashion as MAD MAX is now a platform for movie-goers to scratch their itch for grisly violence. The first film (not to be confused with this film’s title), THE PURGE, offered up fairly thrilling home-invasion tension, while the last two entries THE PURGE:ANARCHY and THE PURGE: ELECTION YEAR expanded the world while offering fraught, but mainly hyperbolic social commentary. The fourth film in the franchise, THE FIRST PURGE, is a prequel that offers no insight that hasn’t already been covered by the previous entries. THE FIRST PURGE chronicles the first experiment where the United States government enacts a 12-hour period where all crimes are legal, including (and mostly) murder. The New Founding Fathers, as this movie calls the dominating political party, are testing their idea to end poverty in Staten Island by offering $5,000 for staying on the island and an added bonus for participating. All the while claiming human psychology needs to kill and act on pure impulse. It’s such a cynical take that yearns to be as edgy as so many social thrillers that came before. As we’ve seen in the previous two movies the plot follows a group of people from low-income housing as they try to survive the night. Dmitri (Y’lan Noel) is a local drug kingpin who has a soft spot for local activist Nya (Lex Scott Davis) and her at-risk little brother Ian (Joivan Wade), despite their rocky relationship they try to make it through the hellscape. 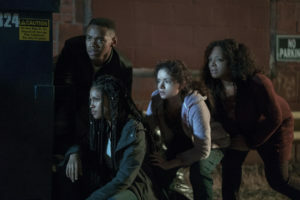 Isaiah (JOIVAN WADE), Nya (LEX SCOTT DAVIS), Selina (KRISTEN SOLIS), and Luisa (LUNA LAUREN VALEZ) in THE FIRST PURGE. Courtesy of Universal Pictures. Screenwriter James DeMonaco, who directed the previous three entries, has characters who are at odds with director Gerrard McMurray’s tone, which so wants to veer into a pulpy direction, yet the political commentary that once allowed these films to be sumptuous hampers anything that can be remotely enjoyable about the garish violence. This is a film that wants to be junk food for the genre crowd, while attempting to operate on a not-so subtle plain offering up political allegories. Or, maybe THE FIRST PURGE is just being honest in what it is: straight up exploitation for the sake of violence. If that’s enough for your action films fine, but don’t expect anything other than sensationalism without style. If anything, its cast (namely, Y’lan Noel) have screen presence enough to carry the film across the finish line, which at times feels more like a marathon than a sprint through one bad night. He gets the chance in the film’s third act to shine with a ridiculous JOHN WICK set of mercenary skills. DeMonaco and McMurray cull from a broth of ideas that are either half-baked or over-cooked within the framework of this world, yet nothing sticks quite like Frank Grillo, who is sorely missed from the series. And Marisa Tomei is in this movie for three scenes; she’s crunching data on the number of “Purge” participants before she makes an unceremonious exit. Exploitation cinema has its place as well done work can be scathing, offensive and imprint on your mind forever. THE FIRST PURGE is exploitation done by way of the studio system and the MPAA, which operates on rules and a visual grammar for mainstream audiences, it’s disingenuous filmmaking. Be a patriot and go buy a ticket for HEREDITARY instead. THE FIRST PURGE opens today.